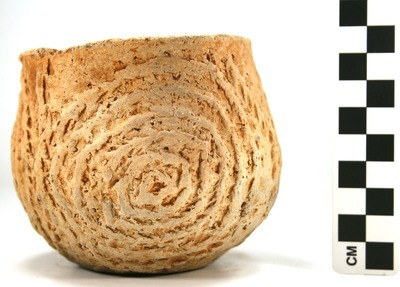 "Vessel 8, Burial 2, 2003.08.733" by Timothy K. Perttula and Robert Z. Selden Jr.
DECORATION (INCLUDING MOTIF AND ELEMENTS WHEN APPARENT): The vessel rim and body are covered by pinched concentric circles. This motif is repeated three times around the vessel. Killough Pinched jar, Vessel 8, Burial 2.